Saturday 3 February. 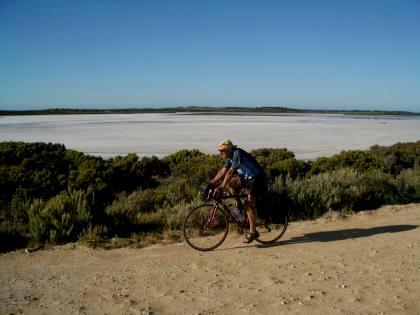 Tailem Bend to Coorong Wilderness Lodge. Today was again clear blue skies but a little cooler than yesterday at only 36C! The flat plains gradually gave way to rolling low hills. We then descended alongside Lake Albert one of the system of lakes into which the River Murray flows to the Sea. Alongside the lake shore there were about 12 penguins. We stopped for lunch at Meningie a small town on the lakeshore. One point of interest which we noted especially today but also on other days of the tour was the large number of motorists who gave us friendly waves and toots. This seemed to be an acknowledgement of the effort required to cycle long distances in remote areas especially on hot days (and the very small number of cyclists attempting this) Motorists generally treated us well and gave us plenty of room. It was all a refreshing change from UK attitudes. 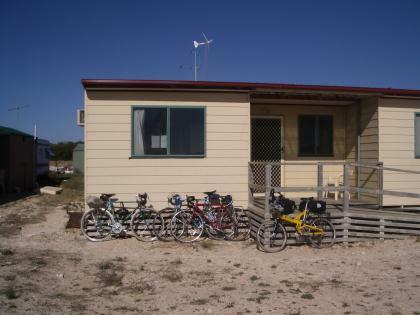 We continued along to Magrath Flat, only a few houses and then into the Coorong National Park. This area is a 60 mile long lagoon with a peninsula of sandunes sheltering it from the sea. We saw a number of dried lakes forming salt flats some with pink and red colouring caused by magnesium deposits. Our accommodation for the night was a remote wilderness lodge run by the local aboriginal community and situated on Hack Point a peninsula running into the lagoon. At the peninsula we turned off onto a rough track alongside a multicoloured salt flat and continued for several miles to the end of the peninsula and the lodge. This was a large Accommodation unit with a central common area and 4 rooms round it. Ours was a room with 2 single beds and 2 beds in a bunk bed. Accommodation was of a good standard. 51 miles for the day and 436ft of climb. Friday 2 February. Victor Harbor to Talem Bend. Today weather was clear blue skies all day and a little hot at 39C, 100F !! I had a hot chocolate on the rooms balcony as the sun rose across the sea at Victor Harbor. After Breakfast we packed the bikes and set off east along Encounter Bay. 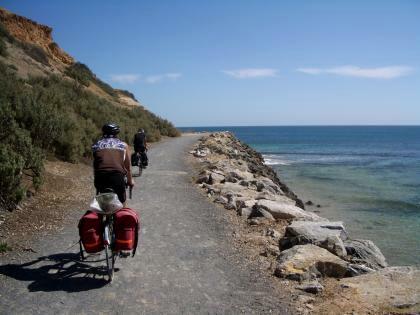 We were able to follow a well signed cycle route called the Encounter Bike Route for 11 miles along the coast to Goowa. The route was made up of a combination of signed back roads with linking cross country paths. We stopped for elevenses at a supermarket caf? in Goowa. Then north to the Wine fields of Currency Creek. Then back roads through quiet bush territory to Milang on the shores of Lake Alexandrina where we stopped for lunch at a caf?. The lake is a very large bay into which flows the River Murray. We stopped for a sort of tea break at a winery near Langhorne Creek. The proprietress had a slight sense of humour failure when 3 of us ordered cold soft drinks. Martin saved the day By ordering a glass of red wine. We continued to Wellington on the Banks of the Murray. The route there was through flat desolate scenery with dried up salt lakes. We stopped in Wellington for our second tea stop. It was by now past 6.00 and as Peter W was slowed by the heat I stayed with him while the others went on ahead to secure the Motel Booking. The route to Talem Bend included a ferry crossing of the Murray River at Wellington. 69 miles for the day and 770ft of climb. Thursday 1 February. 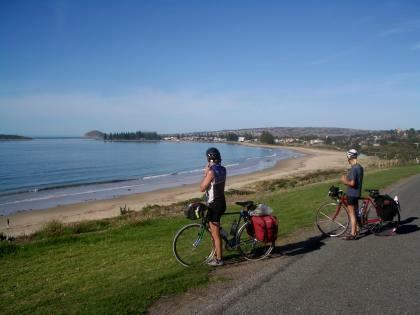 Mclaren Vale to Victor Harbor. Weather today was clear blue skies and temperatures up to 32C. Adelaide just up the road was 34C the hottest place in Australia today. 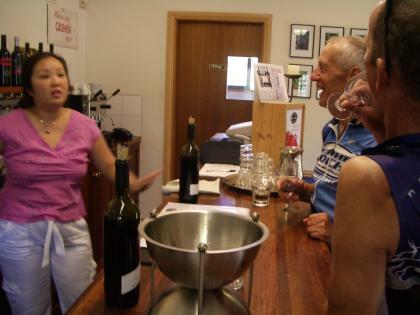 From Mclaren Vale we took the 5 mile paved Shiraz bike trail among vine fields to Willunger. 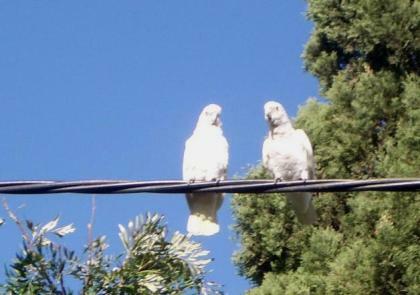 We spotted at the end of the trail large numbers of White Cockatoos which conveniently stayed still for photos. Then a long straight downhill on the Aldinga Beach road and some back roads to avoid the main road south before joining it for a long climb to 750ft. 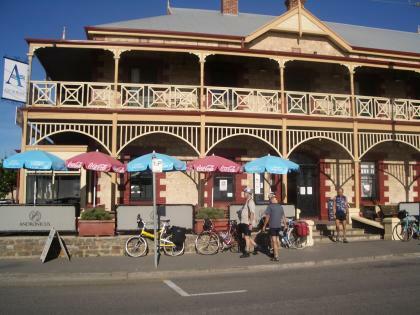 Then down to the town of Myponga for elevenses at a Bakery Caf?. We continued SE on an undulating road to the town of Yankalilla for lunch at another bakery caf?. Then it was a long climb on the Inman Valley road to the head of the valley and we had a rest on the verge at the top to wait for Peter W.
Then a long gradual descent along the mainly dry Inman Valley with scenic views of parkland like fields dotted with large gum trees. Part way down we came across some very good tea rooms run by a Liverpuddlian who had been in Australia for 25 years who entertained us with his stories. We visited the Glacier Rock next to the Tea Rooms. Further down Martin spotted a distant Kangaroo. There was some talk about Kangaroo shaped rocks but then it moved and 2 others hopped about among grazing Cattle. We descended to Victor Harbor and checked into the Anchorage Hotel with a balcony room looking out on the sea across the esplanade and bowls greens. 48 miles for the day and 1856ft of climbing. In the evening we all walked across the Causeway to the famed Granite Island home to a penguin colony. We saw 2 penguins among the rocks but then the area was closed for guided tours. Martin and Peter T decided to go back but Peter W and I joined the guided tour from 9.00 till 10.00. After dark the penguins really came to life with territorial and mating calls and the guide showed many penguins to us in and around holes in the rock. 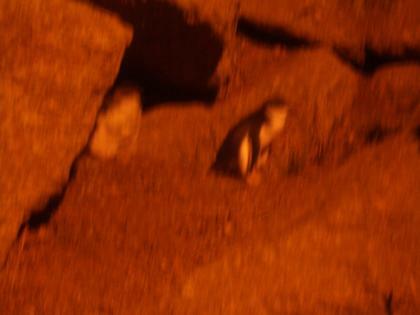 At the end of the tour we saw 2 penguins very close to a path under a light. Cetain late night amorous Penguin goings on occurred. I got a few pictures with a time exposure when they were not moving about too much. Thursday 1 February. Night photo of Penguins. Wednesday 31 January. Wednesday Wanderers Ride. Adelaide to Mclaren Vale. Today weather started overcast but soon cleared by mid-morning to blue skies for the rest of the day and temperatures up to 29C. We had breakfast round the corner and then brought the bikes down from the rooms in the lifts. We put panniers on at the front of the Hotel. An office worker stopped to chat and was surprised we were cycletouring and staying at such a plush Hotel. We told him we liked to end a days ride in style. The days ride involved a lot of meandering on coastal bike paths. We started heading SW from the centre on a bike lane on a main road to the coast at Glenelg where we had elevenses at a caf? on the Prom. Then a bike path down the Prom to Brighton where we cycled up the pier which didn't have any no cycling signs. 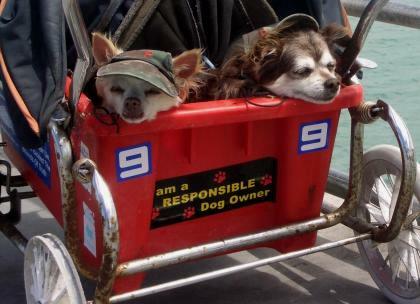 On the pier there was a pram with 2 little dogs wearing hats. We stopped on Brighton's Beach for a paddle, picnic lunch and sunbathe. The 2 Peters went up the road to the Yacht Club for lunch. We went on down the coast to Seacliff, Noararlunger and a cyclepath along a clifftop to Seaford. 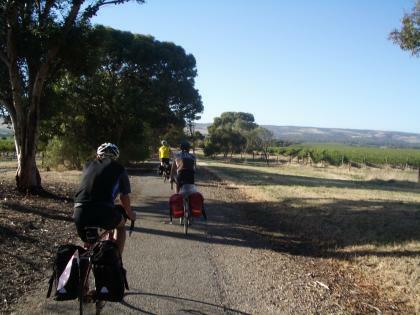 Then a really good cyclepath across country inland direct to our plush motel (again) at Mclaren Vale the centre of a wine area. In the evening Martin and Peter T had a good local wine called Oomoo together with fish and chips!! 33 miles for the day and 1174ft of climbing . Wednesday 31 January. Dogs on Brighton Pier, Adelaide. Tuesday 30 January. 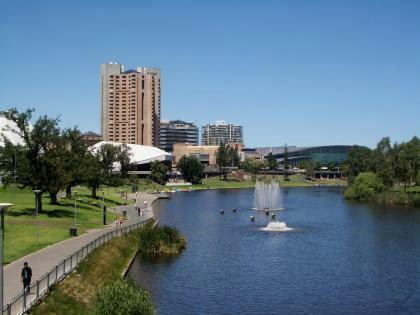 Rest day in Adelaide. Today weather was clear and sunny all day and temperatures up to 30C. After breakfast round the corner we did our washing at the Hotels Guest Laundry. Then some shopping in the main shopping street and down south of the town centre to visit a Bike Shop Peter W had found during his 6 days in Adelaide. 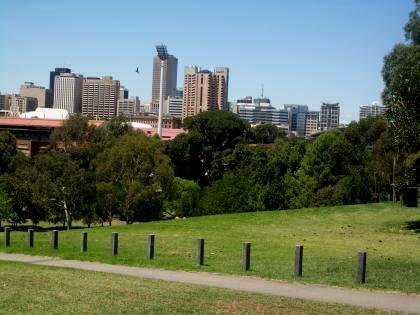 We then went across the River Torrens flowing through Parkland to the north of the CBD (Downtown) We then went to a hill just north of the Adelaide Oval Cricket Ground for views over the City. We visited St Peters Church and were given a special history lesson when the custodians learned 2 of our group came from the South West of England as much of the Churches oak wood had been specially imported from Exeter. Then across to the Botanical Garden and lunch in its Caf?. In the evening I met up with a second Cousin who lives in Adelaide while the others went out to a nearby Thai Restaurant. Tuesday 30 January. Viewpoint above Adelaide. Monday 29 January. Swan Reach to Adelaide. Today weather was overcast in the early morning but soon cleared to blue skies and temperatures warmer than the last few days at 30C. The day was event filled. We had breakfast at 6.00 in the hotels breakfast room and hit the road by 6.45. The first 50 miles of the ride until lunchtime was on quiet backroads with an average of a car every 10 minutes. 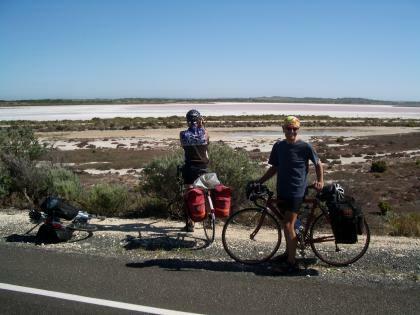 We started by heading south for 15 miles on the plain next to the Murray River. This was a dead straight and panflat road heading towards the appropriately named Walkers flat. On our left there was desert like schrubland to the horizon. On our right we stopped at the occasional overlook viewpoint from the cliffs over the wide valley of the Murray. From the top the wide meandering river bounded by exotic trees looked like something from the Amazon. We eventually turned off the main route and rode down the valley and a smooth operating chain ferry to Walkers flat on the other side. This was a few houses and store where we stopped for snack and drink. It was also where everyone from round about met. We also experienced the usual friendly welcome and interest in our trip from the locals. After a short climb out of the valley we headed west on a straight undulating road heading towards the distant line of hills we had to cross to get to Adelaide. There was the usual wide verge with Bush trees and great range of exotic calls from bush birds startled by our approach. Once a flock of 4 all over bright green parrots startled at our approach flew ahead to the next tree and then the same 4 or 5 times until they ran out of trees. We stopped at a picnic stop just before the climb to refuel. We were warned by a fit looking young man on a mountain bike of the horrors of Cook Hill just ahead. He said he had always walked up it. In the end we cycled up the 1100ft climb with no problems even with panniers. The climb was about 3 miles up to a grade of 18% but only briefly and mostly between 8 and 12%. The road was then up and down on a high plateau Dartmoor style. Martin spotted 2 kangaroos hopping across a field in the distance and I got some pictures with the long lens of the film camera. We stopped for a picnic lunch in the Park at the town of Mount Pleasant. Then it was rolling hills mainly down along the Scenic Road alongside the river Torrens. We stopped at a cafe of a Toy factory with a giant sized Rocking Horse. Then a few miles down the road I spotted the Chain of Ponds Winery. Martin and Peter were keen for some tasting and spent a little time sampling before deciding on a bottle to buy. Further on near the Chain of Ponds lakes I spotted 2 Emu next to the road and got some pictures as they unconcernedly ambled away from us. A short way up the road a police car slowed down beside us and when I stopped the officer shouted out "tell your mate to put his helmet on" Peter had taken his Helmet off a few miles back because of the heat so to avoid any further run ins with the law he put it back on. Further on down we turned onto a quiet byroad and got some good views of the city 15 miles away. The road turned into the busy A11 through the suburbs and down to the city centre and the smart Mercure Grovenor hotel. Later in the evening I took some nightime city pictures by the River. 84 miles for the day and 3574 ft of climb.